It's absoutely bucketing rain here this morning. Bad news for the painters doing the outside of the house in preparation for the estate agent. The walls are done and probably half the windows. Hope it dries up for tomorrow. Dan, Lorna and I shot up to Dalmore today with a trailer load of "stuff". The caravan is being delivered THIS Friday 9th July - definitely. The builders have finished for the moment - they're on holiday for two weeks, so the joiners have moved in. They now have all the downstairs floors out - without collapsing the staircase, thankfully - and have started dwanging. Now, I thought this might be illegal - apparently it's called "nogging" in England - but Graeme assures me it's fine. It's nice to see something being built rather than ripped out. I've been out picking gooseberries, raspberries and strawberries tonight. The raspberries are a little disappointing, but the strawbs are a great crop. The scent of the strawberries while I was picking was wonderful - really jammy. So I'm making some jam - about three pounds. To be honest, the berries are a bit ripe for jam, so it might not set very well but it will taste fine. The gooseberries are for freezing and the raspberries are for eating tomorrow - on my Bran Flakes, to start the day. Well, caravanners. Our new caravan was delivered today. It was wee bit nerve-racking, but it's in place and the Nissan clutch will hopefully recover. As usual, things didn't go quite as planned. The caravan is 12' wide and 35' long. Our entrance gate is about 13' wide and Station Road is quite narrow, so things were always going to be tight. The situation wasn't helped when the tyre on the caravan blew as they boys were taking it off the trailer. Read more on Happy campers! It's been a pretty quiet week. The joiners have finished removing the floors and external wall linings. They have managed to work around the staircase and the cornice in the hall, for which we are grateful. The upstairs is framed and ready for the first fix electrical then the insulation, which is being delivered next Wednesday. Today, Gav and Mark, the joiners, demolished the front porch. What an improvement! When they took it down, we could see the inscription in the stonework above the door confirming that the house was built in 1887. We found some old maps in the house that are contributing to our research. The oldest one is from 1865, which we know from the carved stone above the door, is before the existing house was built. In the area where the house now stands, it says Ã¢â‚¬Å“deyhouseÃ¢â‚¬?. A quick search indicates that this is an old word for Ã¢â‚¬Å“dairyÃ¢â‚¬?. However, I have also found reference to some maps, dated 1826, of Ã¢â‚¬Å“the lands of Buddon, Cowbyres and DeyhouseÃ¢â‚¬?, so maybe it was a farm. After "finding" the lintel stone at Dalmore inscribed with JW1887ED, we were curious about the intials. We wondered if it was perhaps the original occupants - perhaps a marriage stone or the builder's initials. It turns out that JW ED stands for John William Earl (of) Dalhousie. John William Maule Ramsay was the 13th Earl of Dalhousie KT PC, born 29th January 1847, died 25th November 1887. He succeeded his father in 1880 and in the seven years until his untimely death aged 40, he was a great builder and improver of the Panmure estate, spending and estimated £150,000 on new buildings and other improvements. Much of the funding would have come from revenues from coal mining on the Dalhousie Estates in Midlothian. We now have electricity, running water and gas in the caravan! No hot water as the boiler's bust but the cooker and the gas fire now work; the boiler's being replaced in a couple of weeks but we've decided just to keep using the WC in the garden. 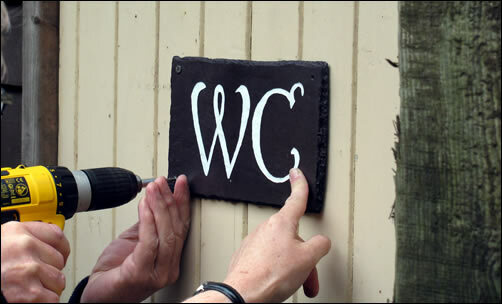 It's now easy to recognise the WC as it proudly bears its name! 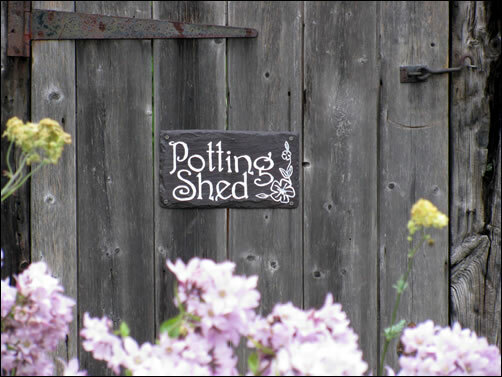 The potting shed now has shelves, so we decided that it should be formally identified. With no little ceremony, the slate name plaque was screwed into place. Linda spent a good bit of yesterday sorting through the pots, discarding the rubbish and washing those we're keeping. We're sure she'll spend many happy hours in the potting shed. Sometimes we might even unlock the door.